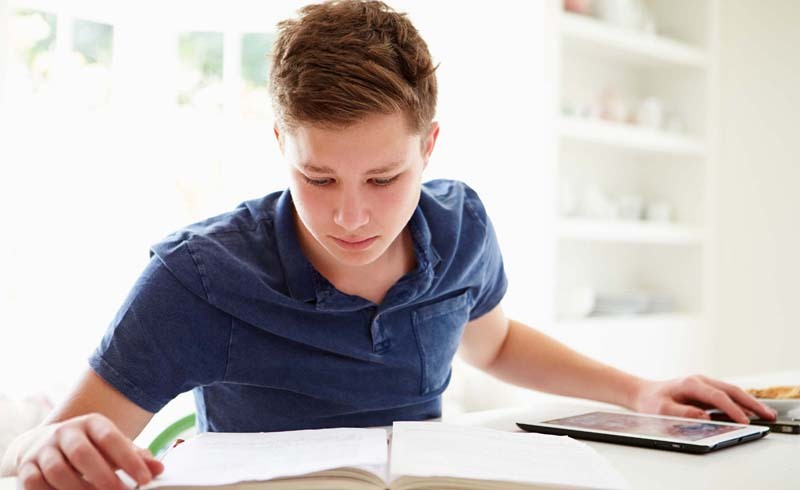 How to help your student study for a test, tackle a science project, and beyond. If you notice your child struggling with a certain subject or aren’t sure his or her work is sufficient enough to make the grade, contact the teacher. “When I was a teacher, parents would always complain weeks later,” says Dolin. Try emailing or calling with your question. Start with something along the lines of: “I’ve noticed Jimmy is not writing out the steps when he does his math homework. Would you like him to do that, or is this OK?” Simply reaching out can get parent, teacher, and child on the same page. Every child is different in the way her or she learns and works best. If your student prefers standing at the kitchen island, let him. If she’s more productive tucked into her desk in her bedroom, that’s fine too. “I tell kids to be detectives and see where they can be productive and focus the best,” says Dolin. While most kids will need some oversight when it comes to homework, it’s best not to hover over them. After around third, fourth, or fifth grade, ask children to show you what they have to do and show you that they’re getting started. “Then walk away,” says Dolin. “It isn’t the parent’s job to be sitting next to the child during homework.” Too much hovering could even send kids the message they can’t do work without a parent present. If a child is stumped on a particular problem, resist the urge to show them exactly what do to (which could be inconsistent with the method they’ve learned in class and cause even more confusion). Instead, ask if there is an example of the problem in their notes, or if there is a similar problem in their textbook. By encouraging your child to go back and find a guide, you’re giving them the skills they need to work independently. Along with tackling any weekend assignments, use either Saturday or Sunday to plan and discuss any long-term projects your child might have coming up. Ask questions about approaching deadlines. “Say, ‘I see you have a science project coming up, what are the steps you’re going to take to start getting that done?” suggests Dolin, who also recommends outlining these steps in an assignment book or Google calendar. For students with busy afterschool schedules, short periods of time—say 45 minutes between band practice and dance rehearsal—can be lifesavers when it comes to getting things done. What’s more, research has found that kids might even be more productive when work is separated into short stints. Teach kids to make use of the time they have, not to wait until they can sit down for two hours on end to push their work out all at once. If you notice your child spending far too much time on homework, help them prioritize. Create must-do, could-do, should-do lists to help. And set a time cap on assignments. “If kids are working inefficiently or are too insistent on it being just right or perfect, then they need an end-time,” says Dolin. Set a hard stop by saying all homework must be complete by a certain hour. When studying for a test, students shouldn’t reread their notes not oblivion. Instead have them read through and stop as they go, asking what’s important and writing those notes in the margins. Discussing the material also works. Going through a study guide on FaceTime with a friend will help information stick. And don’t forget to plan ahead: Break up an hour of studying into 20 minutes of review for three days before a test.